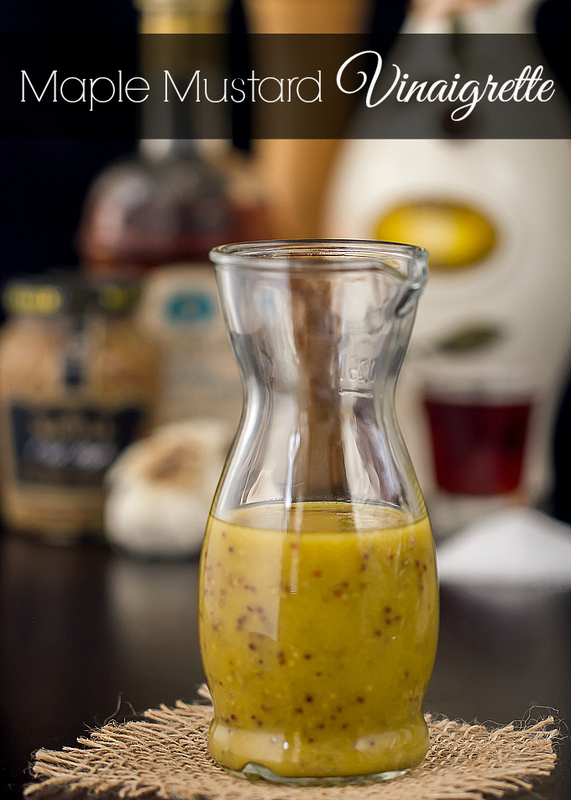 One of my favorite vinaigrettes I find I make over and over again is this Maple Mustard Vinaigrette. I first started making this Maple Mustard Vinaigrette last year when I made a delicious brussel sprouts and broccoli dish that has now become a family favorite. While this vinaigrette is delicious on salads, I particularly love it on roasted and cooked vegetables. It adds that perfect zing to the vegetables! I’ve made this vinaigrette with honey instead of maple syrup and that’s just as tasty. Once you see how easy it is to make homemade vinaigrette, you might never buy it from the store again. Well, maybe not, but it is nice to know how to throw together a tasty vinaigrette. Oil. Vinegar. Salt. Pepper. That’s the basics in a nutshell. But that’s a little boring don’t you think? So start with the basic and then you can add all kinds of goodies for whatever flavor profile you’re going for. For a typical vinaigrette, the standard ratio of oil to vinegar is 3:1, 3 parts oil to 1 part vinegar. Of course that’s just a guide, but it’s a very good starting point. My favorite oil to use is extra virgin olive oil. You could use whatever oil you prefer. As for the vinegar, adjust the amount to your liking. Some vinegars are stronger than others. For instance, I use a white balsamic vinegar in this vinaigrette which is a little lighter tasting and seems to be a little sweeter than regular balsamic. I’ve also made this dressing with flavored speciality balsamic vinegars such as pomegranate, cranberry, etc. Depending on what other ingredients you add to the dressing (garlic, shallots, herbs, etc.) will also dictate if you want more or less vinegar. It’s all about getting the taste YOU like. So dip a piece of lettuce in the mixture as you’re preparing it and give it a taste. It’s easier to adjust the ingredients before you put it on a salad or vegetables! Oil and vinegar don’t really like to play well together for very long. They like to separate. Here’s where an emulsifying agent comes into play. Something like mustard works really well. Honey and maple syrup do too, even egg yolk or tomato paste. In this vinaigrette I’ve used both mustard and maple syrup and the oil and vinegar stays combined. It’s also nice to add some citrus to vinaigrettes such as lemon, lime or orange juice. I think the juice helps to balance the vinegar. typically it’s not a replacement for the vinegar. Having said that, a simple olive oil and lemon juice vinaigrette is quite delicious. So you can see there’s really no rules. Let your taste buds be your guide. And don’t forget the seasonings. You can’t go wrong with kosher salt and freshly ground pepper. In addition, try adding some garlic, or other seasonings such as fresh herbs or spices, shallots, etc. You can use a blender to combine everything if you want. I just use a glass bowl (don’t use aluminum, it will react with the vinegar and give off a metallic taste) and whisk all the ingredients together. Sometimes I even just add everything to a glass jar with a lid and shake it really well. Using the jar method is nice because there’s no mess to clean up…just store it in the fridge! Be sure to let the vinaigrette sit a bit for the flavors to meld before using it. Combine ingredients in jar and shake well. Or, add to a bowl and whisk well. Enjoy over vegetables and salads. Store in refrigerator. Sounds wonderful! Mustard is a terrific ingredient to cook with! Thanks again Judy! PS Hope you’re enjoying your time with your son!!! Thanks Candy…having a great time down under! Love this vinaigrette! I’ve made it several times now and love it over Judy’s roasted Brussels sprouts, broccoli with bacon recipe. It’s great over roasted sweet potatoes, bacon and dried cranberries too. Your sweet potatoes, bacon and dried cranberries with this vinaigrette sounds super yummy! Ooohhhh, I love the idea of using maple syrup in a salad dressing. This sounds wonderful, especially if it is smothering roasted Brussels sprouts. Yum! or smothering any roasted veggie! Also yummy on a chilled asparagus salad! I’ve never tried to make my own salad dressing before and I’m very partial to honey mustard dressing. I think cuz of my sweet tooth, this dressing sounds like something I would really enjoy 🙂 I’m definitely going to give it a try soon! I love this dressing but after a day in the fridge it turns solid. How do you keep it fresh? Hummm, I haven’t made this in a while so I can’t recall that happening to me. Perhaps try warming it up a bit prior to using it.